So, you’re planning on backpacking around China? Get ready for an incredible time. I spent over two months backpacking all over China, and have picked out my favorite places and crafted this China backpacking itinerary. Keep in mind that China is one of the most naturally and culturally diverse countries on Earth, so it’s impossible to see it all on your first trip. After two months there, I still feel as though I’ve barely scratched the surface and I can’t wait to get back and see more. Four weeks is a great amount of time to get a nice taste of China, and you’ll leave wanting to come back for more. Beijing is a city full of interesting history and delicious food. With four days in Beijing, you’ll have time to check out the Forbidden City and Tiananmen Square, the Summer Palace, and even make it out for a trip to the nearby Great Wall. If you really want to be adventurous, you can even try camping on the great wall. Be sure to try out some Peking duck and spend some time exploring the city’s hutongs. Where to stay in Beijing: There are countless hostels and hotels in Beijing. I stayed at the Leo Hostel and enjoyed my time, but any highly rated hostel should be great. Getting around Beijing: Beijing has an extensive metro system, and I used it to get everywhere. Many of the main tourist sites are located within walking distance of Tiananmen Square. The Eastern end of the Silk Road and home of the Terracotta Warriors. Xi’an has a large Muslim Quarter with delicious street food that you need to try. Xi’an has a 13.7 kilometer city wall surrounding the city center, and biking around it was a definitely a highlight of my time there. Getting to Xi’an from Beijing: China has the world’s largest high-speed rail network, so why not check it out? A ride between the two cities on the HSR will take 5 or 6 hours. If you want to save some cash, take an overnight hard sleeper train. Getting around Xi’an: Most attractions are located inside the city walls, so walking is the best way to get around. To visit the terracotta warriors, you’ll need to take a one hour ride on tourist bus line 5 from the east square of the Xi’an Railway Station. Chengdu is mainly known for two things – pandas and spicy food. It’s also a very pleasant city to hang out in. The Panda Research Base is accessible by short metro and bus ride. Try to visit early in the morning, as that is when the pandas are most active. Another good day trip is the Leshan Buddha, which is only 1 hour away by high-speed rail. 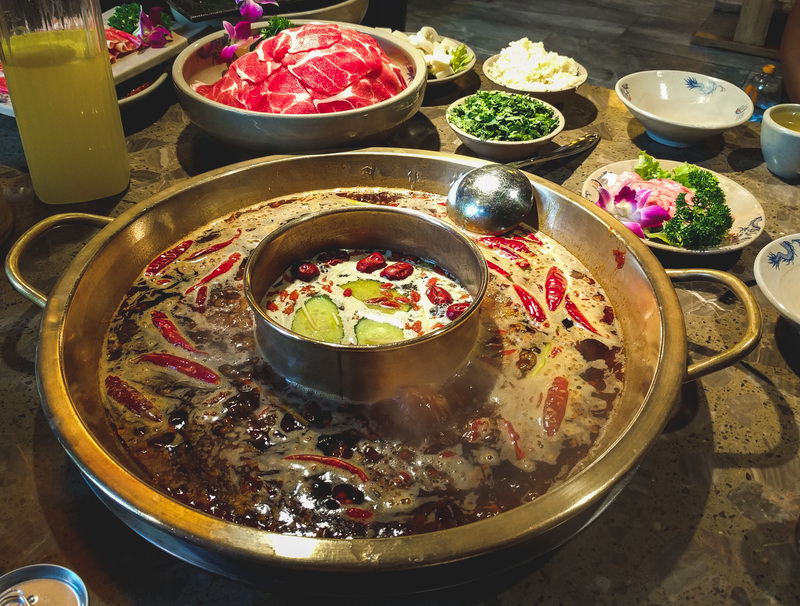 Make sure to try hot pot while you are in Chengdu. Getting from Xi’an to Chengdu: Take the train. You can take a 3-4 hour high-speed train for about $40. Where to stay in Chengdu: I stayed at the Flipflop Hostel and it had a great location downtown. Any highly rated accommodation should be good though! Shangri-La is a historically Tibetan town located in north-western Yunnan. The town has an incredible monastery and an old town that’s been mostly rebuilt after a devastating fire in 2014. At a little over 3000 meters in altitude, you’ll definitely feel a bit short of breath walking around town. Check out my post on travelling in the Tibetan parts of China without a tour for some more info. Getting to Shangri-La from Chengdu: With a short amount of time, the only way to get between the two is by plane. There are daily flights with both China Eastern and Tibet Airlines, taking about 2 hours. I would fly to Shangri-La on day 10 and spend the afternoon of day 10 and all of day 11 visiting the sites. There is an alternative overland route from Chengdu to Shangri-La, that takes you through some seriously remote Tibetan parts of Sichuan. Unfortunately, this route takes a little more time than we have, but if you’re able to give yourself an extra week in China, I highly recommend checking out my guide to travelling overland from Chengdu to Shangri-La. Where to stay in Shangri-La: Tavern 47 was a good hostel. They have nice Tibetan-style decor and great breakfasts. Tiger Leaping Gorge is one of the most insane landscapes in China. There’s a trail running along the northern side of the gorge that typically takes two days to complete. I’ll have a complete guide to hiking Tiger Leaping Gorge published shortly; subscribe to my blog to be notified of when I share it! Getting to Tiger Leaping Gorge from Shangri-La: The hike starts in Qiaotou, which is 3 hours by bus from Shangri-La. Leave Shangri-La early enough so you are able to hike to the halfway guesthouse that same day. There’s very few places in China that have a real South East Asia ‘backpacker vibe’, and Dali is one of them. It’s home to an impressive old town, countless cafes and bars, and beautiful natural surroundings. In Dali, I recommend visiting the Three Pagodas, and renting an electric scooter to ride the road along Erhai Lake (but please wear a helmet). Getting to Dali from Tiger Leaping Gorge: Getting to Dali will require a quick transfer in Lijiang (another popular destination, but very touristy). From Tiger Leaping Gorge to Lijiang, it’s a three hour bus ride. Lijiang to Dali can be done via bus or train – your choice. Train will be slightly faster, but since you’re getting to Lijiang by bus, it may be easier to just take another bus. The train will take about two hours, whereas the bus will take three. Where to stay in Dali: The Jade Emu is an awesome place to stay. They have a great common area with a pool table, ping pong, fussball, and darts. There’s even a bookshop next door that sells books in English! From Dali it’s a bit of a trek to Guilin, but it’s doable in a day if you use the recently opened Dali-Kunming HSR line. In the morning, take a two hour high-speed train to Kunming. Next take an early afternoon high-speed train from Kunming to Guilin, which will take four and a half hours. Spend the night in Guilin, or continue onto Yangshuo if you’re up for it. Yangshuo is a stunning destination and a must-have on any China backpacking itinerary. It’s a very popular destination for both domestic and foreign travellers, so there’s a ton of tourist infrastructure that makes visiting easy. Yangshuo itself is a pretty big and busy town now, so if you’re looking for a more relaxing time, check out the nearby Xingping village. In Yangshuo, rent a bicycle or electric scooter and do some riding around the beautiful countryside, take a boat ride on the incredible Li River, and climb one of the karst pillars for incredible views of the area. Getting to Yangshuo from Guilin: Getting to Yangshuo from Guilin is very easy – there are extremely frequent busses and the ride is only one hour. You can also take a river cruise for more money, but I didn’t bother. The river cruises are popular amongst domestic tourists. Where to stay in Yangshuo: I stayed at the Wada Hostel and enjoyed its very central location. Another nice hostel is Monkey Jane’s Guesthouse – it’s got an awesome rooftop bar area with a view of the Li River. Hong Kong needs no introduction – it’s a massive, globalized city that one could spend a lifetime in and not finish exploring it. Hong Kong feels very different from the rest of China due to its history. Clerks in 7/11 speak English, and everything costs a whole lot more. Hong Kong is definitely worth visiting if you haven’t been before, but if you have, consider checking out the nearby Chinese megacities of Guangzhou and Shenzhen. Visa note: To enter Hong Kong, you have to “leave” China (on your passport). This means that if you have a single-entry Chinese visa, you won’t be able to enter again without getting a new one. If you still want to spend more time in China, consider skipping Hong Kong and visiting Guangzhou and Shenzhen. Getting to Hong Kong from Yangshuo: With the recent opening of the Hong Kong – Guangzhou high-speed rail line, getting between Yangshuo and Hong Kong has never been easier. Simply take a high-speed train from Yangshuo to Guangzhou and then transfer onto another train from Guangzhou to Hong Kong. Overall travel time will be about four and a half hours. Check out Travel China Guide for a detailed schedule. Where to stay in Hong Kong: I stayed at the Causeway Bay Yesinn hostel, but I don’t think I would stay there again. I found Causeway Bay a bit too hectic, so I’ll choose somewhere in Kowloon for my next stay. If you don’t mind having crowds of people around you 24/7, then Causeway Bay is a great location. The last stop on this itinerary is my favourite Chinese city. Shanghai has an endless amount of things to do, foods to eat, and people to meet. Not including Hong Kong, Shanghai is by far the most westernized Chinese city, and people living in Shanghai are open minded. When in Shanghai, spend some time checking out it’s cool art scene, nightlife, and parks. Take a trip to the top of the Shanghai Tower (world’s second tallest building) for some insane views of the city. Also consider a day trip to one of Hangzhou, Suzhou, or even Nanjing. They’re all incredible cities and are very accessible from Shanghai via high-speed rail. Getting to Shanghai from Hong Kong: There’s a decent amount of distance between these two cities, so flying is something to consider. You can take the high-speed train, but the trip will take over eight hours and cost about $150 USD for a second class seat. Where to stay in Shanghai: I stayed at the Blue Mountain International Youth Hostel for its location. East Nanjing Road and the Bund are the most popular tourist areas in Shanghai, and the hostel is less than a ten minute walk from both. If you want to skip certain parts of this itinerary for something different, or have more than four weeks to travel around China, consider some of the following destinations. Jiuzhaigou and Huanglong: Beautiful Tibetan scenery located north of Chengdu. From Chengdu, you’ll need four days to get a good taste of both parks (including travel time). Longji Rice Terraces: If you want to spend more time in the Yangshuo area, I highly recommend visiting the Longji Rice Terraces. They’re only two hours north of Guilin, and are some of the finest terraces in Asia. Check out my guide to hiking in the Longji Rice Terraces for more details. Western Sichuan: Rather than flying between Chengdu and Shangri-La, there’s an overland route you can take between the two cities. The route goes through some seriously remote parts of Tibetan Sichuan. I wrote a detailed post on how to travel the route. 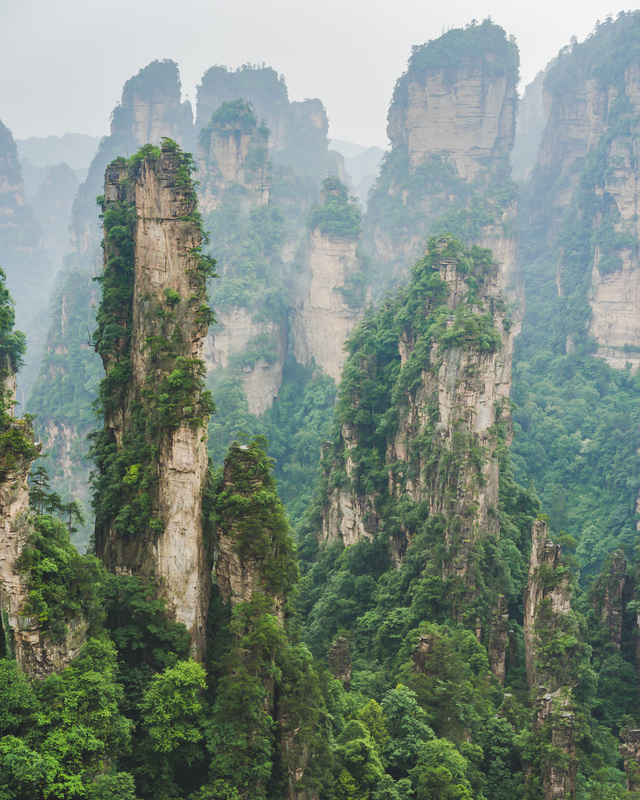 Zhangjiajie: This is where Avatar got inspiration for it’s incredible landscapes. Zhangjiajie is a great place to visit for a few days, but is a bit out of the way from other destinations. Tibetan Autonomous Region: Unfortunately, to visit Tibet as a foreigner you must be on a guided tour. I decided to take one, and enjoyed it. If you’re into amazing mountains and Tibetan culture, consider visiting. Xinjiang: I haven’t been yet, but am planning on visiting in 2019 as part of my travels in Central Asia. Like Tibet, Xinjiang is far different from the rest of China. I hope this itinerary has helped you better plan your China backpacking adventure. You’ll have a great time no matter where you choose to visit, it’s an awesome country. Feel free to contact me with any other questions and I’ll get back to you. If you liked this post, consider sharing it! Subscribe to my mailing list to be notified of my future posts. I’ll be travelling a ton in 2019, and will have a lot of great content coming out. Thanks for all the information! We are heading to Lijiang next week and considering hiking Tiger Leaping Gorge. I know you mention in your post you’re working on a guide–any chance you could share some key tips? Did you encounter any rain when you did the trek? A little concerned about the microclimates. Thanks! Hey Vivian! I highly recommend hiking Tiger Leaping Gorge! Don’t have the full guide ready yet, but here are some tips. If you have any extra baggage that you don’t want to carry during the hike, you can leave it at Jane’s Guesthouse for a small fee. The first part of the hike is the toughest; it’s a lot of uphill walking, but the trail is easy to follow and well-trafficked. After you’ve done the first part you’ll feel relieved that going forward will be much easier. There are lots of locals selling things like water and snacks along the trail, so don’t worry about running out of water or anything. Stay at one of the guesthouses in the middle of the gorge for the night (most popular is the Halfway Guesthouse) and you’ll be treated with an incredible sunset and lots of stars at night! I didn’t encounter any rain and I was there in June. March/April should have even less chance of precipitation, so I wouldn’t worry too much! When I was there, it was really hot! I personally run very warm while hiking, so I wish I’d have started my hike earlier in the morning rather than mid-day.